of Cyprus, Pissouri which is located half way between Limassol and Paphos and is a great base from which to explore both destinations. It extends from the traditional village on the hillside, down to the sheltered Bay with its clear blue sea, both areas possessing unique character and charm. The locality boasts a wide selection of restaurants, tavernas, bars, cafes, supermarkets, and a public beach. Further details indoors:: High chair and baby cot can be provided upon request. Rates include: Weekly cleaning service. Welcome grocery pack and air conditioning, which can be used for either cooling or heating. Wander round the narrow streets of the old town radiating out from the fishing harbour. The medieval castle was the site of the royal wedding in the Middle ages between Richard the Lionheart and Berengaria of Navarre, and now houses the Cyprus Medieval Museum, Browse through the array of goods and produce in the atmospheric Market. All our villa are located within walking distance to sea and to all amenities. Feeling relaxed and batteries recharged! Great accommodation, very comfortable and not too secluded. The pool was a little too cold due to the time of year but we managed 1 dip! Sitting out on the patio by the illuminated pool at night was so peaceful. Pissouri has easy access to lots of places of interest; the Troodos Mountains are a must, amazing views! It’s just a short walk from the Villa to the local village and beach where there are plenty of shops and restaurants to hand. The pizzeria was an excellent choice for us; friendly and yummy food if you are happy to eat fairly basic pizza and, it’s great value for money. The only criticism we have was the lack of operating instructions at the Villa for the cooker, safe and hot water. We did eventually manage to work this out and there is always the option of contacting the Rental agency.... a little time consuming though! Overall we had a lovely, relaxing holiday and would certainly return to Cyprus; renting through HomeAway was easy and efficient; it’s the second consecutive time we have used them and they offer so much scope from cheap and cheerful to the more luxurious within the UK and to many more countries. Well worth it, thank you. The description of this villa and its location were Excellent as was the layout and facilities. The property was clean and well maintained, the swimming pool guy came twice which maintained hygiene, the pool was large about 5m x 10m with walk in roman steps, a focus point of children and families relaxing. The owner provided excellent customer service, and the welcome pack(milk, bread, tea, coffee wine etc) was great. We would definitely recommend this property to friends. Many thanks for your review, so glad you had a great holiday and hope to welcome you again soon . Pissouri Area: Pissouri Village is one of the most attractive, friendly villages in south-west Cyprus. It is situated in the principal vine growing area with sultana grape vines covering the surrounding countryside. It's situated just off the main Paphos to Limassol road. It has a unique and attractive character loved by all visitors. Visitors can find almost anything they need in the village. In the centre of the village you will find the village square. It's perfect for a lunch time snack, a gourmet meal or a huge traditional meze . Pissouri Bay is a beautiful blue flag beach a few minutes away from the villa and there you will find plenty of water sports available, some paragliding for those a bit more daring wind and kite surfing lessons available daily. Pissouri Bay offers a varied range of good value restaurants and bars to help you enjoy the night life and once a week you can enjoy the local culture at the Cyprus night. Golf: About the Golf Course of Aphrodite Hills which is located 10 minutes drive from the villa. In the restaurant you can savour delectable Cypriot specialities, international cuisine and an extensive wine list, or just enjoy the breathtaking view from the terraces. A premier golf academy, practice holes and pro-shop enhance your golf experience. • 30% deposit on booking and final balance due 8 weeks prior to departure • Free use of air conditioning units for heating and/or cooling is in rental price. • Free welcome pack with first essentials (tea, coffee, sugar, milk, bread,cheese, ham, water, jam, fruit, orange juice, wine, etc.) provided on arrival. 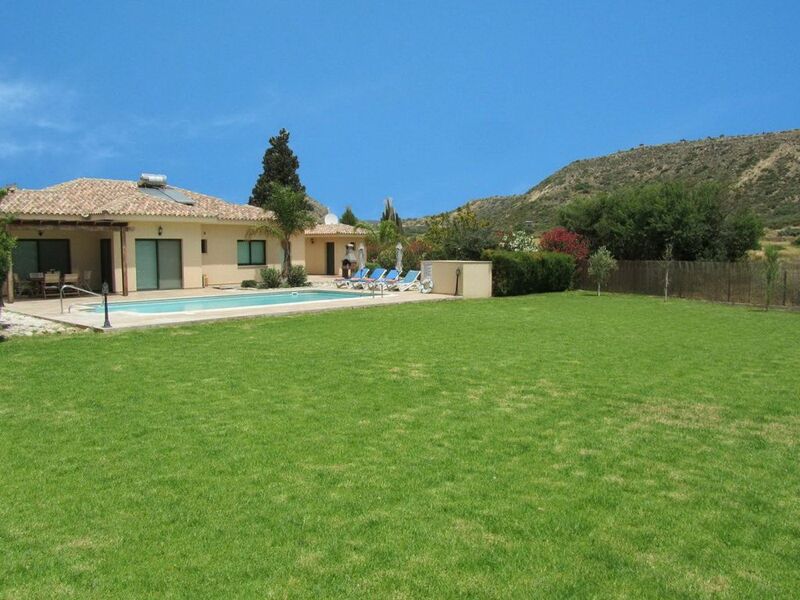 • Villa cleaning once every 7 days • Pool maintained twice a week.